I mentioned in the last post that after Rory Gallagher died in June 1995, The Guardian published an appreciation that I sent them … I wrote in my diary at the time that it was ‘quite heavily edited down, and somewhat disappointing’. Anyway, Milo expressed an interest, so I’m posting it here for him – he has an excellent Gallagher tribute blog here. This is the edited-down version, for what it’s worth; I no longer have the longer piece that I wrote originally. If asked to choose seminal music footage from my teenage 1970s, when my part of Ireland was a single-channel area lacking even Top of the Pops, I might consider Planxty, Horslips, Bob Dylan or Steely Dan. 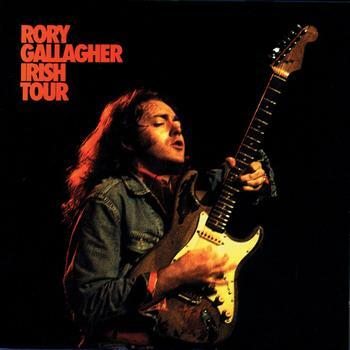 But in the end I would choose Rory Gallagher, probably performing in a three-piece band at some festival on the European mainland with the song title misspelt on the screen; singing, seeming to play rhythm and lead guitar simultaneously, or acoustic guitar and harmonica, or maybe mandolin. Long hair, check shirt, closed eyes, jeans, sweat, wild rhythm and blues. This was as exciting as music could get. It still is. Yet I have only ever owned one Gallagher album, which I don’t have now. There was no hype surrounding him, and maybe people like me are more influenced by hype than we like to think. I first became aware of him on a visit to Cork when I was about 14. Gallagher, a Corkman, was a local idol and one of my cousins, a Gallagher fanatic, played some tracks for me, loudly. It was a bit frightening. Later my first girlfriend loaned me a tape of Against the Grain. It was more accessible and I liked it. Another friend loaned me Calling Card, with the wonderful acoustic ‘Barley and Grape Rag’. Some of my friends were declaring solemnly that Jimi Hendrix had been the world’s greatest guitar player, with Eric Clapton second and Rory Gallagher third. Now that Hendrix was dead, Gallagher was ranked second. We were proud that an Irishman could be second best. Looking back, we underestimated him. I moved to Dublin, completed a year at college and went to see him at the Macroom festival. Two friends and I hitched down separately and, arriving hours before the other two, I had time to kill in a pub. An old man said that he liked Rory but preferred Engelbert Humperdinck, and danced around the bar with a companion, singing ‘The Last Waltz’. It was a good weekend, despite having our sleeping bags stolen. The main thing I remember about the Gallagher set is the extraordinary volume. I went to see him again in Dublin before Christmas, and was with my cousins in a wildly enthusiastic audience in Cork the next year. But when he died I hadn’t seen him live in 15 years, and only rarely on television. He looked flabby and overweight at the Self-Aid concert in Dublin in 1986; his time seemed to have passed and he apparently made no effort to promote himself. I didn’t think of him at all until his death, but now that he’s gone, I and thousands like me will ask for his CDs. It’s hard to recall how different Ireland was 20 years ago. You took what you were given or you looked for something else. I think my generation was the first to look for something else. We were lucky that Rory Gallagher, one of our own, was there to confirm through his music what some of us already knew: that the world is bigger than Ireland, that faith can’t be contained by a church, that there is an infinity of ways to think and ways to live. That Corkmen could be famous for playing the blues as well as for playing hurling. But the vast majority of us didn’t thank him, and that’s a shame. Thanks very much, Aedín. Yes, he was amazing, and a lovely person too. The Irish Tour 1974 documentary is worth a look if you ever get the chance. This is Pauline and Sean’s favourite track, and a good insight into Rory, I think. A sensitive man and an outsider.